The sustainable 100 - compiled for the tenth time this year - is the ranking of the Netherlands’ 'greenest thinkers and doers' and the most influential people in the field of sustainability. Daniëlle herself considers the nomination to be a compliment for all Both ENDS staff: "I was given this spot in the list thanks to all of us." The nomination shows that the themes that Both ENDS has found extremely urgent for years, are now really being picked up in the public debate and are provoking an outcry in an increasing proportion of Dutch society. We think this is good news, but at the same time we know that a great deal still needs to be done to ensure that Dutch trade and investment activities do not damage the world, but rather make a positive contribution. We all continue to work with passion and enthusiasm! The sustainable 100 list is composed as follows: everyone can nominate someone and provide good arguments for this nomination. An independent jury selects 100 candidates from this long list, after which they are ranked. On the10th of October, the Day of Sustainability, the list will be published. Here you will find more information about the jury and the process (in Dutch). Both ENDS is co-organising a double panel discussion 'Delta Dynamics: Dutch Masterplans and the SDGs' on June 26th. This is part of the conference 'Critical Perspectives on Governance by Sustainable Development Goals: Water, Food and Climate (25-26 June 2018)' organized by the Centre for Sustainable Development Studies at the University of Amsterdam. At the sessions Both ENDS' partners from Jakarta and Manila will be presenting. 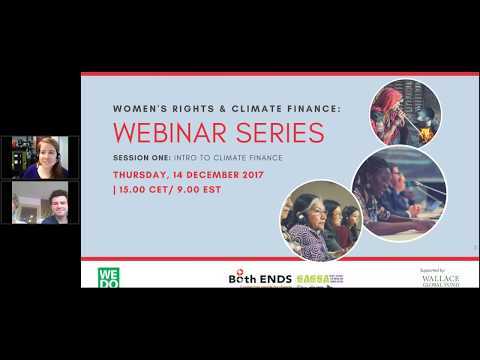 Join us for the third session of this five-part series on women's rights and climate finance, aimed at building knowledge and power to ensure finance flows benefit local women's groups, respond to community needs and respect human rights. Women around the globe are at the forefront of addressing the impacts of climate change and environmental degradation, designing, implementing, and scaling up their own solutions. Socially defined gender roles often position women and girls as stewards of the physical, economic, and cultural well-being of their communities. 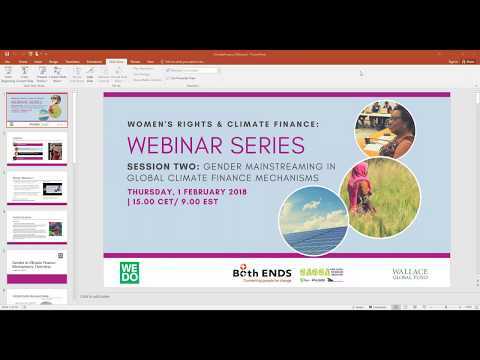 The fifth session of our five part series on women's rights and climate finance, Experiences and Perspectives of Women Engaging in Climate Finance, shared the insights of three activists who have been serving as GCF Monitors as part of the "Women Demand 'Gender-Just' Climate Finance" initiative. 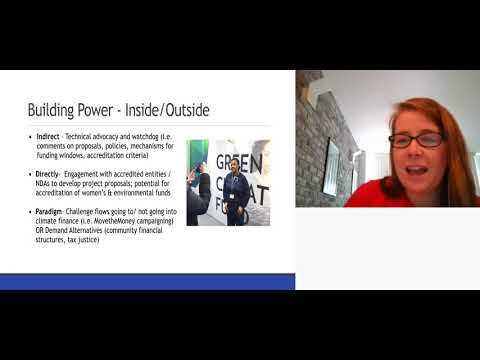 They spoke about their processes of learning about climate finance and connecting with others to monitor climate finance in their communities and regions, discussed the value they have found in this work, and answered questions from webinar participants. 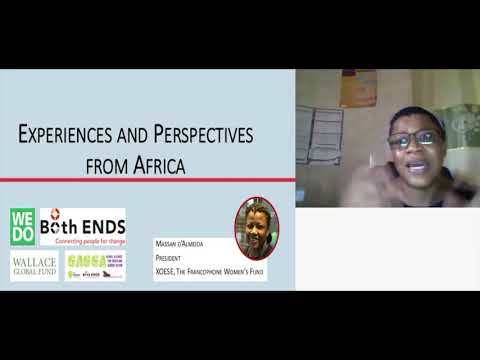 The fourth webinar of a five part series on women's rights and climate finance: Strategies for Organizing to Influence, Monitor, and Track Climate Finance (from Global to Local), focused on strategies to engage with various actors to both facilitate and advocate for the meaningful inclusion of the perspectives and experiences of women's groups, affected communities, and other civil society stakeholders in the design and implementation of projects and programs. The second session of our five part series on women's rights and climate finance, Gender Mainstreaming in Climate Finance Mechanisms, provided an overview of how gender equality has been mainstreamed into global climate finance mechanisms, including a deep dive on gender considerations under the Green Climate Fund by Liane Schalatek of the Heinrich Boell Foundation - North America. This Introduction to Climate Finance is the first of a five part series on women's rights and climate finance, aiming to build knowledge and power to ensure finance flows are benefiting local women's groups, responding to community needs and respecting human rights. This session will outline the climate finance landscape, as well as the key challenges and opportunities we hope to explore in this webinar series. Raju Pandit Chettri meets Minister Kaag: finance for women-led local climate action is critical! During the 24th Conference of the Parties (COP24) of the UNFCCC taking place in Katowice, Both ENDS partner Raju Pandit Chettri – director of Prakriti Resources Centre in Nepal - was one of the selected Southern leaders to meet with the Dutch Minister of Development Cooperation and Foreign Trade, Sigrid Kaag. We asked Raju about his expectations, messages, Kaag's responses and his experiences of the meeting. 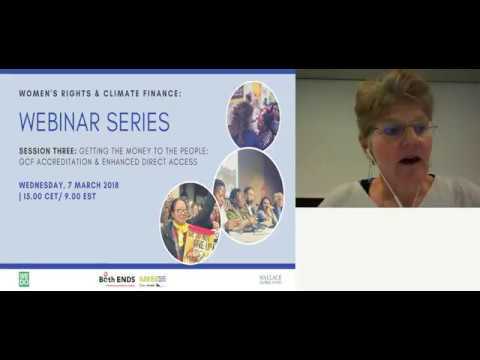 Join us for the fourth session of this five-part series on women's rights and climate finance, aimed at building knowledge and power to ensure finance flows benefit local women's groups, respond to community needs and respect human rights. The webinar will be conducted in English with simultaneous translation in Spanish and French. The third session of our five part series on women's rights and climate finance, Getting the Money to the People: GCF Accreditation and Enhanced Direct Action, focused on accessing the Green Climate Fund through working with stakeholders at the country level (engaging with the National Designated Authority), utilizing Enhanced Direct Access, and seeking accreditation. Joan Carling is awarded with the UN’s highest environmental honor! We congratulate Joan Carling, member of the permanent commission on indigenous peoples of the UN, for having received the Lifetime Achievement Award as 'Champion of the Earth' by the UN Environment! This is the UN's highest environmental honor, given to six of the world's most outstanding environmental change makers once a year.